Cambelt Replacement FREE for life! We fit dealer supplied cambelt kits at an amazing price, so call today, and check when your car needs it's belt changed. Pay from £299.00 in all including VAT! 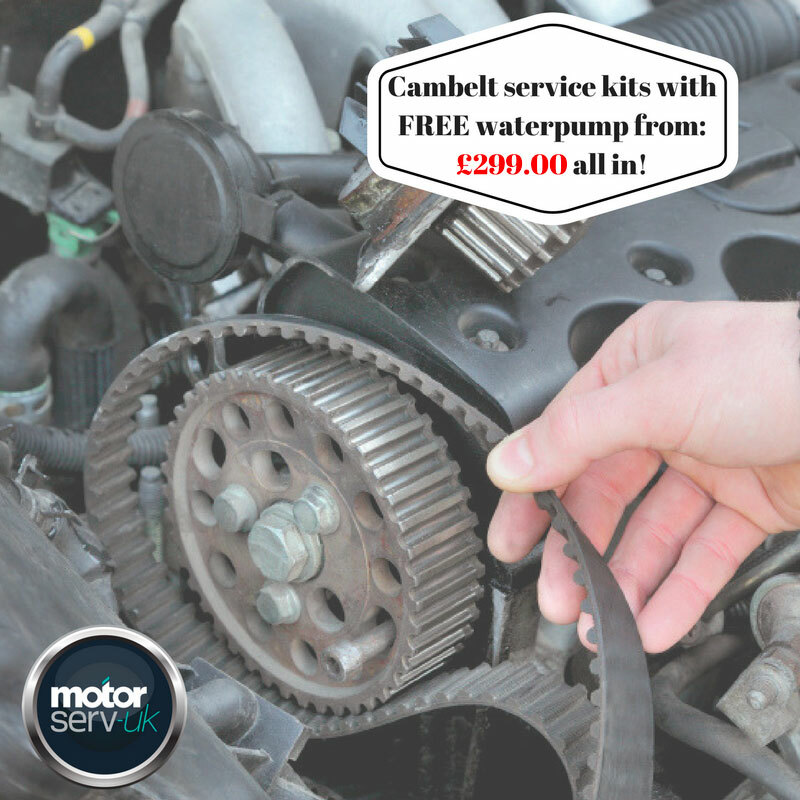 All Cambelt Service Kits come with a FREE Waterpump included! Get your Cambelt Service Kit replaced by MotorServ-UK and never have to pay for any replacements in the future. A Cambelt or ""Timing Belt' change is one of the most important aspects of maintaining your car, if you neglect it - you could end up needing a new engine. The Volkswagen Group recommend most VW, Audi, SEAT and Skoda engines must have their cambelt changed between every 60,000 to 80,000 miles or 4/5 years depending on engine type. Your service manual will tell you the correct mileage for your cambelt change or better still simply give us a quick call on 0121 733 3387 or email your query to solihull@motorservuk.com and we'll let you know straightaway. Are you 100% sure that your cambelt has been changed at the correct time or mileage? Are you 100% sure that your cambelt has been changed at all? If you have just purchased or are looking at purchasing a used car, does the previous owner have proof of a cambelt change at the correct mileage? If you have answered any of these questions with NO then we recommend you book a cambelt change with MotorServ UK Solihull. For such an important component as the cambelt, peace of mind is vital. Not only can you be assured that we fit exact dealer specification parts but these parts are also backed by a 2 year mechanical failure warranty. If the unthinkable happens within 2 years of the fitting date simply return the car to us and we will repair any damage caused by the cambelt failure completely FREE OF CHARGE. In shortâ€¦we offer the same warranty as your Main Dealer.